Blizzards in the Forecast! 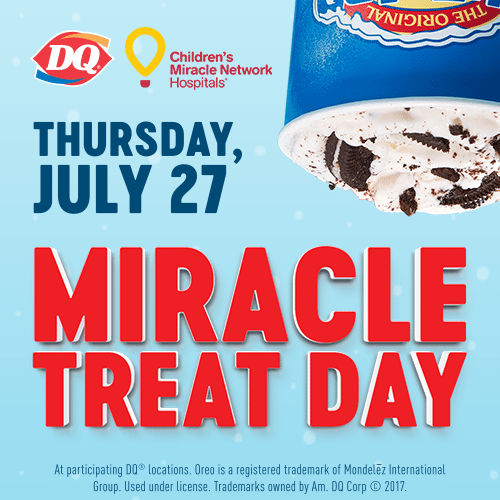 – Dairy Queen Corp.
Northern and Central Jersey, Blizzards are in the forecast for July 27, 2017 and the chance of miracle making is 100%! Dairy Queen’s Miracle Treat Day is July 27, 2017 and you can give back to your local CMN Hospital when you buy a blizzard at a participating location where $1 or more from each Blizzard purchased will be donated to Children’s Specialized Hospital! See if the Dairy Queen near you is participating by visiting www.miracletreatday.com. Interested in volunteering? Contact mbocciolatt@childrens-specialized.org to learn how you can get involved! Next post: Miracles Never Tasted So Good!